Summer at Grand Lake is awesome all by itself…but when you throw in some cool events that you won’t find at most other lakes…it gets even better. And the Summer of 2015 at Grand Lake is just like that. Of course their are festivals and fundraisers and galas and raft-outs and parties on the lake and parties off the lake all summer long. And…one quick disclaimer…it’s been raining this spring and early summer. A bunch. And things that happen at the lake are kind of a weather – and lake level – permitting kind of deal. So keep that in mind. Anyway, here are 5 things (plus a couple more) you really need to check out at Grand Lake this summer. Oops – You missed it. But we’ve added another event so we still have a solid 5 can’t miss events…. 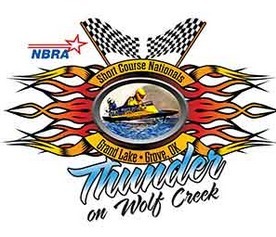 The 3rd Annual Thunder on Wolf Creek – Hydroplane and Runabout Short Course Nationals – returns to Wolf Creek Park in Grove on June 19, 20 & 21. 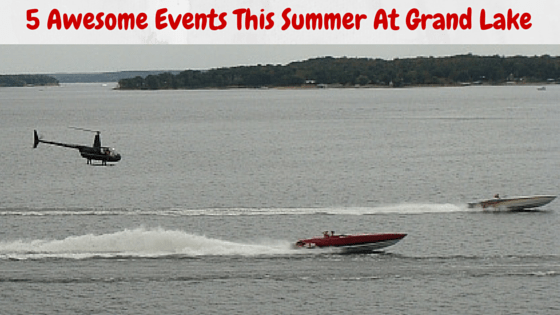 Known as the ‘Greatest Show on the Water’ with 20 heats of hydroplane and runabout boat racing, the 3 days of racing excitement on Grand Lake in Grove is something you don’t want to miss. Admission is free, but get there early as last year’s attendance was over 3,500 folks and more are expected this year. Thunder On Wolf Creek is conducted by the Oklahoma Boat Racing Association and sanctioned by the National Boat Racing Association. To learn more about Thunder on Wolf Creek, visit their website at http://www.thunderonwolfcreek.com/. From mid-June to mid-July every year is Grand Lake’s unofficial 5th season – Fireworks season. And while the amateurs really get after it the whole time…we do look forward to the pros! You can see the entire 2015 schedule of fireworks at Grand Lake HERE. Friday night, July 3rd, will be fireworks all over the lake – from the Grand Lake Fireworks in Disney at the south end to the Monkey Island Fireworks to the annual Grove July 3rd celebration at Wolf Creek Park. If you are out in a boat…you can position yourself to at least see 2 out of the 3 shows….it’s just up to you which 2 you choose! Saturday, July 4th – Duck Creek Fireworks. The one that started it all. Generally regarded as the ‘largest fireworks show in the State of Oklahoma’ the Duck Creek fireworks is an event not to be missed, complete with the return of the F-16 flyover (or maybe a surprise) before the start of the fireworks and after the War Birds flyover that happens throughout the early evening. If you have not taken in the flyover and Duck Creek Fireworks…you really owe it to yourself to check it out. Oh man…this one is going to be cool! 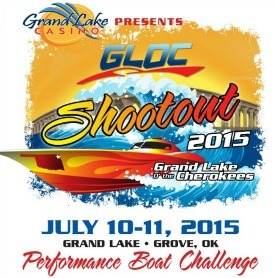 The Grand Lake O’ the Cherokees (GLOC) Performance Boat Shootout comes to Grove and Grand Lake July 10th & 11th. A ‘Shootout’ is not a race per se, but is a radar run challenge to see which boats – in different classes – can reach the highest speeds on a 3/4 mile straight line course. Boats up to 50 foot in length and capable of speeds approaching 150 to 200 mph from across the US will be visiting Grand Lake to compete in the radar run Challenge. The Shootout itself will take place on Saturday, July 11th, beginning at 10:30 am on the South side of Sailboat Bridge in Grove. Friday will be a day to get up close and personal with the boats and owners of these awesome boats as they will be parked and on display at the Grove Civic Center, leading up to the VIP Family Fun Night and Street Party at the Civic Center at 5 pm. You can find ALL THE DETAILS about the GLOC Shootout on their website at http://glocshootout.com. The Big Bass Bash returns to Grand Lake on July 18th & 19th this year after a hugely successful debut in 2014. Prize money has doubled, with a guaranteed payout of $123,000! Last year there were approximately 800 boats on the lake for this event and that number is expected to grow to 1,200 boats this year. The Big Bass Bash is a bass tournament designed for amateurs only. In fact, there are restrictions on who can enter – if you’ve ever won over a certain amount in a tournament or if you’ve ever paid over a certain amount to enter a tournament – You’re Out! The bash is set up to give all of us – who just like to fish – a chance to win big money like the pros! There are 4 weigh-ins per day – every 2 hours between 8 am and 2 pm – with guaranteed payouts for the largest bass at each weigh-in and the then a first, second and third place prizes for the largest fish of the weekend. So, what do you win if you catch one of the 3 biggest fish of the weekend? Not too shabby for a weekend of fishing, huh? To enter and for complete rules and details, visit the Big Bass Bash Website. As you may or may not know, 2015 marks the 75th anniversary of the completion of the Pensacola Dam. And that is a good reason to throw a big party! Details are not easy to come by at this point, but this will be a GRAND event at Pensacola Dam with a day of bands in the State Park with a huge raft out and all sorts of other surprises…stay tuned! Here is what you need to do…keep August 8th open and plan on coming to Grand Lake for the biggest and best birthday party you’ve ever been to. As soon as details are released…I’ll let you know right here on GrandLakeLiving.com. September 5th – that’s the Saturday of Labor Day Weekend – you’ll want to be at the back end of Duck Creek from 1 pm to 6 pm for this great Grand Lake party. Two bands, bikini contest, RedNeck Yacht contest, all sorts of awesome giveaways and the best part is that all the proceeds – after expenses – go to support Make-A-Wish Oklahoma. 2015 Aquapalooza on Saturday, July 18th – This on the water raft-up and party happens on lakes and in bays and rivers throughout the country and world. At Grand Lake…it’s one giant party you don’t want to miss. Stay tuned for details. 2015 Great Grand Bobber Drop on Saturday, August 8th – After taking a year off, the Great Grand Bobber Drop returns to Grand Lake with 100’s of prizes ready to be claimed. Learn more here. Make plans now to check out these great events happening throughout the summer of 2015 at Grand Lake! NextA Grand Water Quality Camp Adventure!